Interested in a workshop for you and your company? Contact us now for a morale building experience you'll never forget! 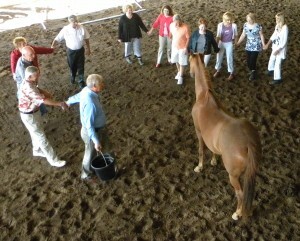 In order to maximize the benefits of working with horses, all packages are limited to a maximum of 12 people. Do you want an innovative and effective approach to overcoming team challenges and developing emotionally intelligent teams? The Heart Horses Equine Experience is a unique and fun way to bring together your group, strengthen leadership, solve problems, increase productivity, learn new skills, improve communication, build resiliency, and strengthen your team. Equine Assisted Learning (EAL) includes experiential (hands on) activities with horses that are designed to challenge a group, discover new solutions, and help a group gain insight and clarity. All activities are unmounted (no riding) and no horse experience is necessary to participate. Each Equine Experience is facilitated by an Equine Specialist and a Mental Health Professional with an option to add a Leadership and Organizational Coach.